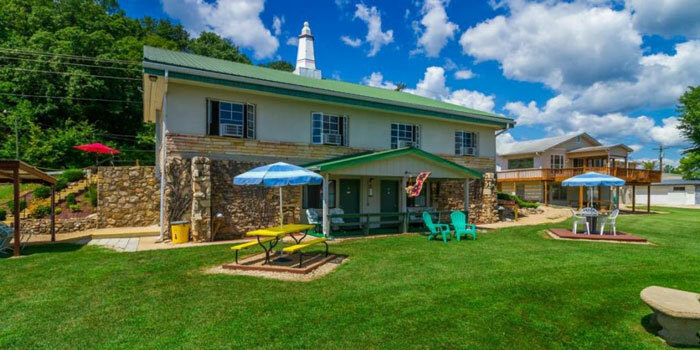 Are you looking for a great family vacation destination, a relaxing weekend get-away, or how about a nice place for your family reunion? 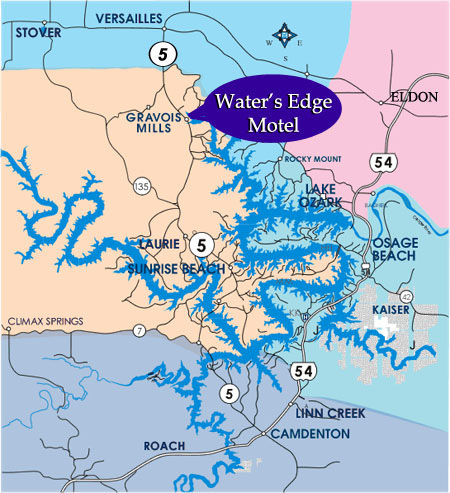 We are located on the calm, west side of the lake, in the quaint town of Gravois Mills, MO at the 10 mile marker on the Gravois Arm of the Lake of the Ozarks. 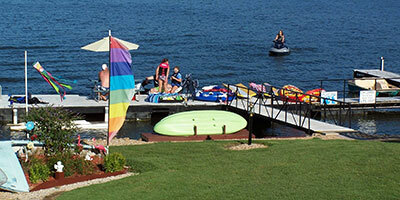 Highway 5 is your road to a good time at the Lake of the Ozarks! Be it Spring, Summer or Fall, the drive will be scenic and enjoyable. 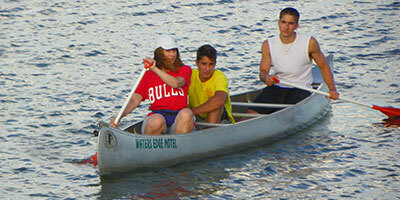 The Gravois Arm of the Lake is known for its calm water. 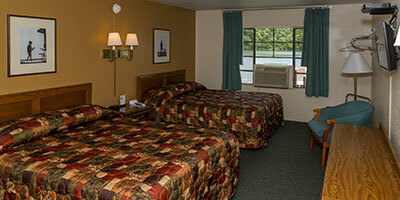 Water’s Edge Motel is your front door to fun and relaxation on the Lake. Many guests enjoy having cookouts in the yard! We have grills and picnic tables for your use. Child’s crib rental is $12.00 per stay, childs weight under 35lbs. US-50E to SEDALLA, turn (right) South onto US-65. Take MO-52 Ramp toward COLE CAMP. Turn RIGHT at stop light onto MO-5. We are 9 miles South of VERSAILLES on MO-5 on the left in the town of GRAVOIS MILLS. Take 65S to Hwy 52 at Cole Camp Exit. We are 9 miles south of the MO52/MO5 intersection in Versailles on MO-5 on the left in the town of Gravois MIlls. Take US-54 EXIT at Kingdom City; EXIT #148 SOUTH toward Fulton. Stay on US-54, 57.3 miles to the first ELDON EXIT, (Business 54) . Continue to follow MO-52, 18 mi and stay straight onto MO-5. Continuing straight to VERSAILLES at stop light MO-52 / MO-5 stay straight through the light. We are 9 miles SOUTH of VERSAILLES on the left in the town of GRAVOIS MILLS. Take 1-44 EAST toward Lebanon, Mo. Continue on NORTH MO-5 thru Camdenton, Sunrise Beach and Laurie.